The mediation course I took centered upon interest based negotiation. I will credit and expand upon that later as I develop this site. The essential elements that struck me were the three themes of Interests, Issues and Positions. Step one; our interests are based upon our needs. Step two; our needs are based upon our values. The course referenced Abraham Maslow’s Hierarchy of needs. We must have our needs met. For a durable solution to be sustained the process required three means of satisfaction; Substantive, Procedural and Psychological. This was my first step the way to understanding conflict more fully. The apparent conflict between religion and science has always eluded resolution in my mind. I couldn’t square the concept of Original Sin and the Holy Trinity in my rational mind. My intuition told told me a different story. As did other thoughts I had about science. The book Spontaneous Evolution by Bruce Lipton, Ph.D, and Steve Bhaerman brought coherence to this distortion in my mind. The subtitle of this book is, Our Positive Future (And A Way To Get There From Here). This was the second step for me for resolving my own inner conflict. I recently learned about Moral Foundations Theory from the book, The Righteous Mind by Jonathan Haidt. The subtitle is, Why Good People Are Divided By Politics and Religion. That was the third step that brought balance to my see-sawing mind. What we are taught and what we believe must make sense to us even if it makes little rational sense at times. Myth, mystery or magic can rattle our rational minds. Yet science, religion and politics are interwoven into the cultural clashes we witness every day. I reject no honest seeking of personal truth that contributes to peace on the planet. Classical Physics, Quantum Physics and Metaphysics. This is my approach to the three way intersection of conflict we may find in mind, body and spirit. You are welcome to join me at any time and in any space we may find ourselves together. I joke that I was a born mediator. I was born in the middle of the year ( astrologically, we are a Gemini ) in the middle of the century, of medium statue and complexion ( for a white guy ) and with a balance between right and left handedness (equally uncoordinated with both hands). I see things quite readily from different perspectives. This led me to never fully trust or believe anything too certainly. The song lyric saying you must stand for something or you will fall for anything rings true for me. The sad irony of this is my struggle to speak my truth because I was often told that what I believed was right was really wrong. I mean really wrong. Like life-threatening wrong. Not that I was threatened with literal death by anyone, but I felt a fear of death as I read about and saw other people get killed for expressing their truth. The Certified Mediator course I took opened my eyes and my mind to a new understanding of conflict and the solutions available through alternative dispute resolution. Participating in Speaking Circles and ultimately becoming a certified facilitator around the same time was a congruence of life-changing opportunities which have led me to this “work” I call Express Ways. Becoming an elder in many cultures involves rituals that honor and recognize the individual and the wisdom they may bestow upon others. I claim no special wisdom that needs to be honored. It is my honor to share with you the lessons I have learned. You can read “ These Boots” in tab labeled “The Flipside” on this site to get a sense of my perspective in one form of expression. I hope to use some humor and what some may consider tough talk to drive home the points I want to make on this Road to New Solutions. Mostly I want to respect those with whom I share this life’s journey. I may be getting older, but I refuse to get old in silence. Truth is, what we don’t say is what may kill us. Happy birthday to me. Katie Glennon is the midwife to Express Ways. She embodies the song lyric I heard years ago that says the value of old friends is “...they see where you are and they know where you’ve been.” Katie has stood by me on this Road To New Solutions even when we had to cut our own path through the jungle of old stories we told ourselves that obscured the true vision of what was being created. Speaking her truth with love and compassion, she encouraged me and cajoled me, teased and scolded me and kept me honest and faithful to my true Self. Her courage emboldened me to take risks, not with building the business, but with dropping the notion of placing a price on my value as a man in this world. When more of us speak to one another with such integrity and clarity my “work” will be revealed as being successful at fulfilling my dream of a world with less conflict and and more authentic relationships. 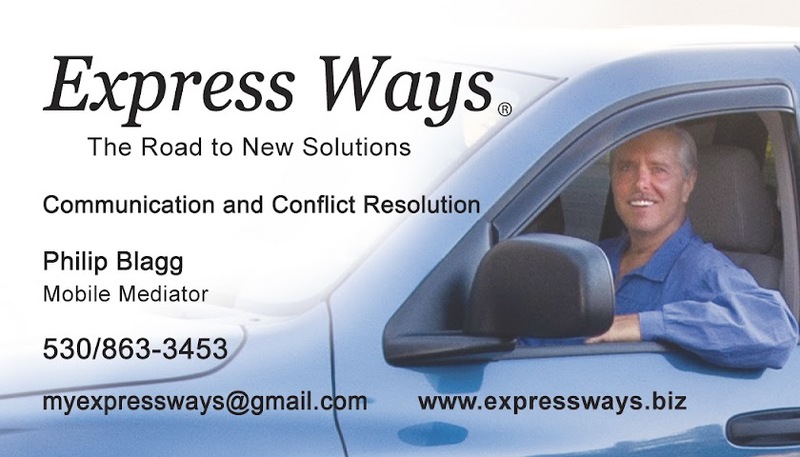 Express Ways is not a partnership. It is the culmination of a coalition of my very good friends and some people I have had serious challenges dealing with providing me with opportunities to resolve the conflicts in my mind that has led to broken relationships, anger and mistrust. Reconciling the perceptions of blame and shame and projecting onto others that which I am responsible for has been a familiar road I no longer choose to travel. It has been Katie whose voice guided me to and from the space where there are no roads and that landed me back here safely to advance the journey. Thank you Katie. May our friendship continue from here to beyond our wildest dreams. Words matter when it comes to issues of war and peace. What is said and how it is said can make all the difference in the world. And to the world. At this perilous time in the world as the United States citizens are memorializing our militaries’ war dead, we have leaders who are fomenting conditions which may lead to many more military and civilian deaths worldwide. I choose to memorialize this day as the day I begin to Express Ways in which I have been complicit in speaking words that are less than peaceful and the effect that has had in my life and in the world. This blog spot is being dedicated to finding that Road to New Solutions I allude to and which has been so elusive to me. In mediation, the mediator is to remain neutral and to fully engage in seeking the best interests for all parties involved in a dispute. I have had experience in that realm that i am proud of. As a Speaking Circle Facilitator I have used the magic of this process to assist my clients and myself to speak our individual truth with authenticity, opening ourselves to potential Relational Presence with ourselves and with others unlike any process I have known outside of therapy sessions. It is these two practices that I find to be compelling me to begin to act as the Peacemaker I have long felt called to be. Not a protester. Not an activist. Not a therapist or minister. A United States citizen who must speak truth to power in a manner that is above the diatribe and debate I see and hear in the “unsocial” media. I encourage dialogue that advances the moral foundation of our country. I am not always proud to be a US citizen, but I am always grateful. My gratitude extends to our military personnel who gave their all for me to be free to speak. It has been a chaotic year. Many of our worst fears and attributes as individuals and as a society have been revealed in their unblemished truth. It is not a pretty picture. The overwhelming sense of upheaval is reminiscent of the challenges we faced in the 1960s. Our complete worldview is undergoing a transformation unimaginable a few short years ago. From politics to economics to social issues to our environment, the very survival of our self and national identity is feeling threatened. Managing our way around this confusing, conflicting environment of the mind we find ourselves in requires new tools that we may use to begin to feel a degree of safety and control that enables us to function in loving, compassionate and effective ways in the world and the relationships we value. As I gain more clarity and composure, I am committed to developing this site and the work I am in the world to do in order that my family and other loved ones may benefit and expand the circle of caring for one another and this planet we share. I abhor the social media sites I see as dialog dissolves into attacks and counter attacks. I will explore other means of getting this work out to the people who are interested in it in a holistic, organic expansion of interconnectedness. How that comes to pass will be up to anyone who wishes to provide their insight and guidance with me. The 2016 Presidential campaign triggered much angst among many people. Including me. Regardless of our choice of candidate, all Americans and many people around the world witnessed a devolution in communication that is an embarrassment to many citizens of the United States. This has fired my passion to begin using this site to enhance respectful, effective communication between people with profoundly differing views of the issues and the solutions possible. Families may be torn apart in a fashion similar to the tragic divisions during the run up and engagement in the Civil War, in which lives were threatened or lost in the heat of the battle of words or in actual battles. It is imperative to me that I do not regress into dialogues or diatribes that demonize those of differing viewpoints. It is oh, so easy to take that cheap shot at an opponent or their supporter. We must do better. Over the course of 2017 I will periodically post blogs on this site and may distribute some through email or other means as I learn the technical side of this form of communicating. I intend to develop and make available the tools I have learned to assist all of us on a journey of safe conversation and conflict resolution. For now, I wish you well and hope we can explore more fully the Road to New Solutions in a respectful, effective manner for the good of all. My lifelong passion has been centered around establishing authentic relationships and resolving conflicting interests through finding common values. Certification as a Mediator and as a Speaking Circle Facilitator formalized what I have intuitively been called to do all my life. My travels from my home state of California to Alaska, Antarctica, Nevada and to Colombia has broadened my perspective and deepened my appreciation for the diversity of our human community. I am excited to share my interests with those who value cooperation in expanding the opportunity to improve relationships with their loved ones and other important people in their lives.